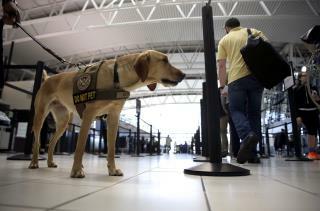 (Newser) – Call it doggy discrimination: The Transportation Security Administration says it'll transition away from pointy-eared dogs over the next several years, in favor of less-intimidating canines with floppy ears. "We find the passenger acceptance of floppy-ear dogs is just better. It presents just a little bit less of a concern. Doesn't scare children," TSA Administrator David Pekoske tells the Washington Examiner, which reports about 80% of the TSA's 1,200 canines come from sporting or hunting breeds with floppy ears, including Labrador retrievers, German shorthaired pointers, wirehaired pointers, vizslas, and golden retrievers. That is discriminatory! Somebody should stand up for pointy-eared dogs before it's too late. I don't have a dog but I love german shepards. They look so wise. Two vets I used when I had cats had german shepards that lived at their office and both had the kindest eyes and most soulful expression. Even my nasty but loved cat Tom didn't mind him. I baby sat a white german shepard and when my ex came to get her I didn't want her to go. She even growled at him she was so protective of me. I wish I could have stopped that. She was the best dog. I think they should use wiener dogs for all security roles. Simply because it'd be hysterical every time they showed up.